Energy saving LED lighting is super hot right now and business for my new customer, Henergy LED Lighting, is just exploding. We gave them a clean and bright new website design to match their product. This fresh modern WordPress template includes some nifty animations and effects including a bouncy popup window on the front page alerting viewers about Ameren’s 90% off incentive program. Yeah, that’s right… NINETY percent off. That’s almost free. 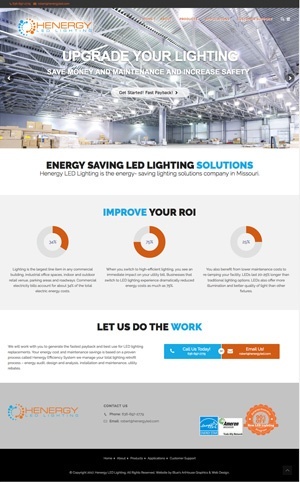 If you have a building or parking lot that needs lights, contact Henergy and they’ll help you save money and increase safety with LED lighting. Plus you’ll feel awesome for loving the planet so much!